NEW YORK, USA -- Describing “alarming” developments in Ukraine – from the capture of European observers and the violent takeover of Government buildings by separatist groups, to the shooting of the mayor of a major eastern city – a senior United Nations official this evening appealed to all sides to “work expeditiously” at putting the crisis-torn country on the path to stability. 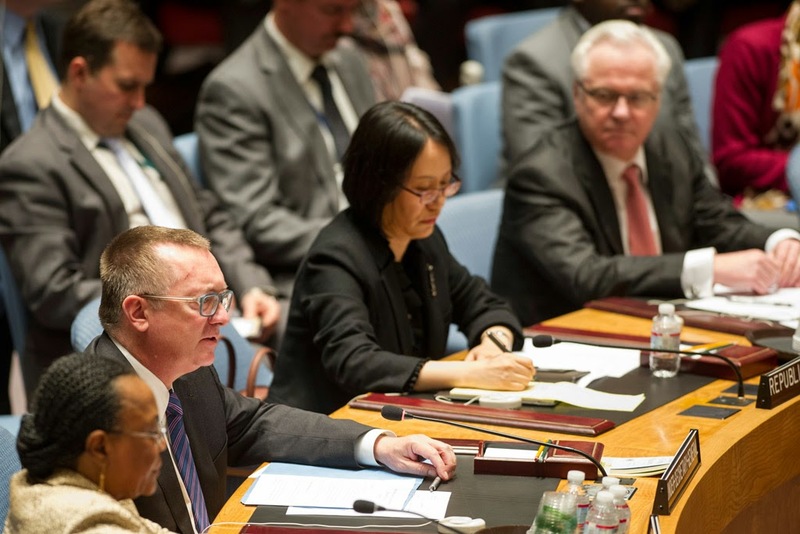 Under-Secretary-General for Political Affairs, Jeffrey Feltman (second left), briefs the Security Council on the worsening situation in Ukraine. “The implementation of the Geneva Statement has stalled as parties have sought to give different interpretations of what had been agreed upon,” he said of the 17 April deal on a series of steps to de-escalate tensions in eastern Ukraine that reportedly include demobilizing militias and vacating seized Government buildings. “Unhelpful rhetoric on the part of many has further escalated the already high tensions,” he added. The Geneva Statement capped months of political unrest in Ukraine that led to the removal by Parliament of President Viktor Yanukovych in February. This was followed by increased tensions in the country’s autonomous region of Crimea, where Russian military were subsequently deployed and a secession referendum was held in mid-March, in which the majority of the region's people voted to join Russia. By mid-April, tensions flared in eastern Ukraine as Luhansk, Kharkiv, Donetsk and at least 5 other cities in the region were targeted by uprisings and the violent takeover of Government buildings. And in the city of Slovyansk, where the police station was seized, self-declared separatist groups reportedly demanded a referendum similar to the poll held in Crimea. Mr. Feltman reported today that the situation in parts of eastern and southern Ukraine continues to deteriorate. On 25 April, a group of military observers under the auspices of the Organization for Security and Cooperation in Europe (OSCE) and accompanying Ukrainian staff were captured and detained. Although one monitor has been released, the rest remain in detention. Reiterating UN Secretary-General Ban Ki-moon’s strong condemnation of the incident, Mr. Feltman urged those responsible to release the detainees immediately, unconditionally and unharmed. Meanwhile, he said, gangs of militia and armed civilians “are increasing in number and springing up in more and more cities across the region,” seizing buildings, setting up roadblocks and cutting whole towns and communities off from the rest of Ukraine. There are increasing reports of torture, kidnappings and violent clashes, he added. “Earlier today, self-declared separatist groups reportedly began an operation to take control of Luhansk. Just a few hours ago, they stormed the police headquarters in the city, opening fire with automatic weapons and throwing stun grenades at police officers still inside,” said Mr. Feltman, adding that the State Security building seized earlier his month remained under control of those groups. He went on to tell the Council that yesterday, Hennadiy Kernes, the Mayor of Kharkiv, was shot in the back by unknown assailants and remains in critical condition. “On the same day, self-declared separatists seized a local government building in Kostyantynivka, also in the Donetsk Oblast." While in Donetsk itself, a pro-Unity rally turned violent when separatist elements reportedly attacked the group with clubs and chains,” he said, adding that two days ago, clashes between some 400 opponents and between 400 and 500 supporters of a unitary Ukraine broke out and resulted in a number of injuries. “What I just described are developments which have occurred only in the last four days. These developments should alarm us all,” Mr. Feltman declared. As for the efforts of the international community, he said that the UN Human Rights Monitoring Mission provides fact-based and publicly available information on the state of human rights in Ukraine. In addition, the Secretary-General has continued his high-level engagement with world leaders. “He is your partner in using his good offices to help bring about a return to diplomacy and a peaceful resolution. In this spirit, he has asked me to return to Ukraine next week,” Mr. Feltman announced. “Let us work concertedly and expeditiously towards peace and stability,” Mr. Feltman said.